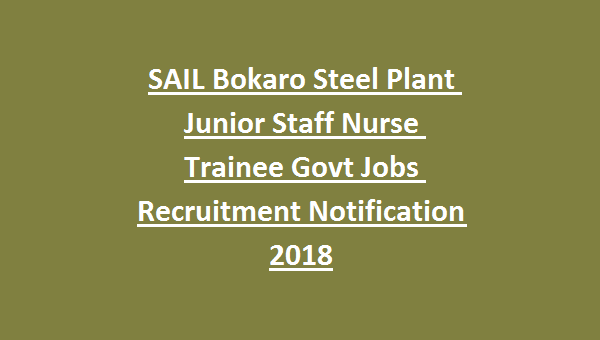 Junior Staff Nurse in SAIL Bokaro Steel Plant. The appointed Staff Nurse will get an Pay scale of Rs.16,800-24,110. The interested candidate shall have a minimum qualification of B.Sc Nursing from an Institution recognized by Nursing Council of India and other qualifications as prescribed. The candidate must have the physical requirements as specified in the official notification. The candidates will be selected on the basis of tests conducted. The interested candidates shall apply online from 05/12/2018 to 26/12.2018 in the official website of SAIL. The candidates applying for SAIL Jr. Staff Nurse shall be in the age limit of 18-28 years. However, there are certain age relaxations for certain categories. For SC/ST candidates 5 years, OBC candidates 3 years and 10 years for person with disabilities. The candidate shall have a Degree in B.Sc (Nursing) from an Institution recognized by Nursing Council of India/ Full time Diploma of 3 years duration in General Nursing and Midwifery from a Government recognized Institution after Intermediate or 10+2 science and valid registration in Nursing Council of India/State Nursing Council and with at least 1 year post qualification experience in a hospital/ Nursing home. The candidate shall have the following physical requirements for the post of Junior Staff Nurse in SAIL. The interested candidates shall appear for an written examination. The candidate shall attain 50% in the written examination. After qualifying the written test the candidate shall be eligible for Trade test/Skill test. This will be final test for the selection of the Junior Staff Nurse posts. The results will be provided on the official website of SAIL. The selected candidates for the post of Junior Staff Nurse will be given training for a period of 2 years and after that probation for 1 year shall be given. After the probation period the candidate shall be eligible for S-3 grade pay. The selected candidate will get a scale pay of Rs.10,700 in the first year and Rs,12,200 in the second year. Trainees will get the benefit of medical facilities for self, spouse and dependent children. The Interested candidate shall pay an application fee of Rs.250 at the time of application. Female, SC, ST candidates are exempted from the application fee. The Interested candidates shall apply for the Junior Staff Nurse in SAIL in the official website of SAIL through online mode only. Before filling the application form, the candidate shall register himself for provisional eligibility. After filling the application form the candidate have to pay the application fee through online mode only. 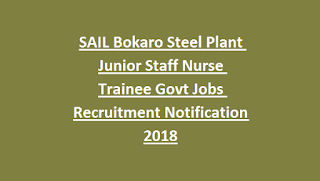 For the further information and more details visit the official website of SAIL and view the official notification of Junior Staff Nurse.